This post is the third of a ten-part series called Exploring Codable and Core Data in Swift 4. // The Encodable method encode(to:) is implemented by default. This post is the second of a ten-part series called Exploring Codable and Core Data in Swift 4. // The Codable methods init(from:) and encode(to:) are implemented by default. The next example is for a larger JSON object representing the movie, Aquaman. Let’s assume this movie object, for the time being, is a simplified data model—only representing the id, title, tagline, and genres. // Int and String both conform to Codable. // The Decodable method init(from:) is implemented by default. // Movie is still decodable after adding an Array of Genre, which is also decodable. In order to support manual decoding or encoding, Codable needs to know which data attributes should be transformed into Codable types, such as Int, Float, Double, Bool, String, etc. Codable types can declare a nested enumeration called CodingKeys which conforms to the CodingKey protocol. When this enumeration is declared, the cases listed represent the properties which should be encoded or decoded from the external data to your codable type. Properties can be ignored from encoding or decoding by omitting their key from the enumeration declaration. Note: When omitting properties, a default value must be provided in the initializer to support automatic Codable conformance. Because most languages have their own naming conventions, we can't assume that a given key from JSON should be the exact property name in its Swift representation. Thankfully, CodingKey also supports RawRepresentable which allows our properties to follow the Swift API Design Guidelines, while the raw value can represent the JSON key. The example below uses alternative keys for our Movie model. // Int, String, Date, and Double all conform to Codable. // Some JSON keys should be renamed to follow the API Design Guidelines. Even though codable types handle both encoding and decoding, we should be explicit about the functionality we would like to expose when implementing the protocol(s) on our own types. Therefore, if our custom type will only be used to decode values, we should conform to Decodable instead of Codable; we should conform to Encodable when we only need to encode values as well. // We decode the value to String, then transform into the desired Date type. Note: For more information about the container types used when customizing the encoding and decoding process, see KeyedDecodingContainerProtocol and UnkeyedDecodingContainer. Ever since Codable was introduced in Swift 4 / Xcode 9.0, I’ve been researching ways to combine the two services to provide an iOS framework to reduce their complexities, while improving maintenance and scalability. Most iOS applications these days are data-driven and receive their data from server-side API calls, process the response into their own data structures, and display that data to the User Interface. 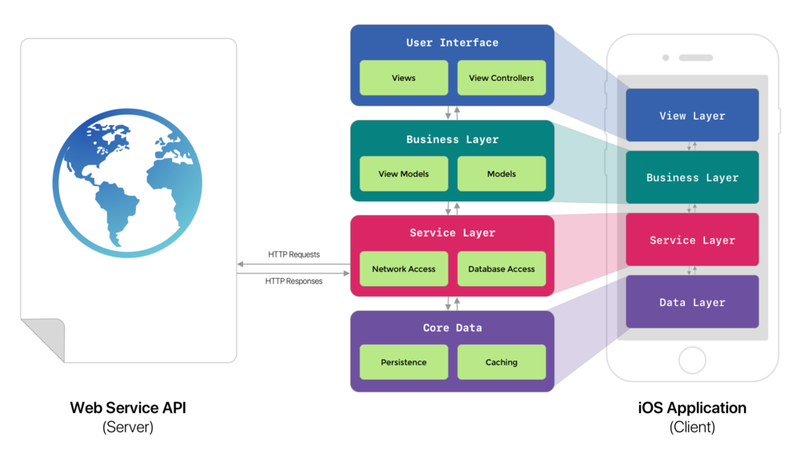 Diagram displaying a common iOS application architecture when sending/receiving from a web server | © 2018 by PXPGraphics, Inc. All rights reserved. Diagram displaying similarities and differences in responsibilities between Codable and Core Data | © 2018 by PXPGraphics, Inc. All rights reserved. Note: I strongly believe sharing knowledge this way helps readers from all levels of experience and backgrounds to learn and improve their skills, and help the community grow and build together. So any feedback, questions, or comments from you would be greatly appreciated. Thanks in advance, and stay tuned for updates!